I love carbs too much to ever go on a carb-free diet (how do people do it?! ), but I have been interested to try out some healthier versions of things like pasta, in an effort to mix up my meals a bit more. 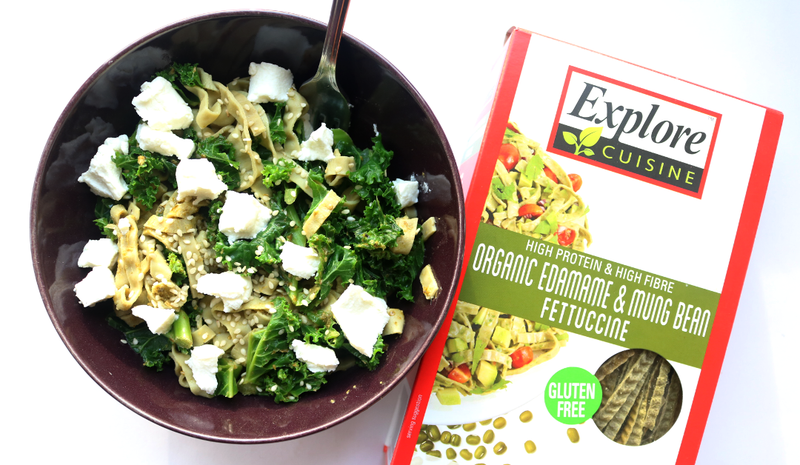 In last month's Degustabox, I received a box of Explore Cuisine Organic Edamame & Mung Bean Fettuccine that I couldn't wait to try. 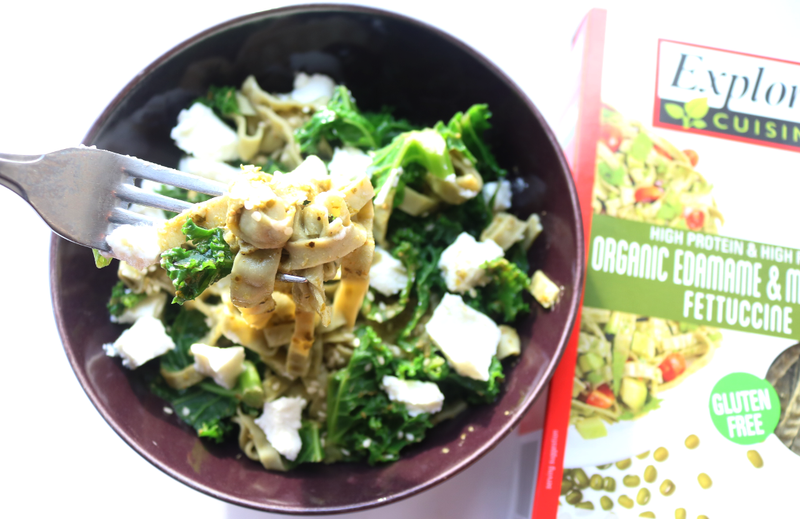 This fettuccine is created from just two ingredients; Organic Edamame beans (Green Soybeans) (80%) and Organic mung beans (20%), which makes it naturally gluten-free, higher in protein and fibre than regular pasta, and suitable for vegetarians and vegans. I've tried some brands of gluten-free pasta before, and to be honest, I hated them - the texture was all wrong and they have a tendency to turn into mush if you cook them for a minute longer than intended. But that's not a problem with this as you can get a really good al-dente texture in just 5 minutes, and even if you cook it a little longer, it doesn't go soggy or mushy - hooray! For an easy mid-week lunch or dinner that's ready in less than 10 minutes, I decided to throw together some of this fettuccine with a little leftover Pesto, Curly Kale and a generous amount of soft creamy Goat's Cheese, which is similar to a dish that I had in Italy about 5 years ago. If you're vegan, simply swap the Pesto for a free-from vegan-friendly one, and either skip the Goat's Cheese or use a similar dairy-free alternative cheese instead. Bring a saucepan of salted water to the boil. Add the Fettucine, reduce the heat and simmer for 5-7 minutes. Add the Curly Kale in the last 3 minutes, or lightly steam in a separate pan if preferred. Drain and stir in the Pesto, mixing everything together well. Transfer to a bowl, sprinkle over some Sesame Seeds and add some small chunks of soft Goat's Cheese if desired. Enjoy! What's your favourite pasta alternative?